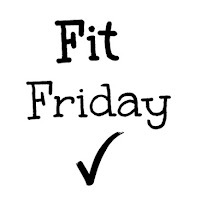 It's Fit for Friday! Time to check in. Workouts: I worked out 4/7 days this week. Two sports practices (one was cancelled because of snow), one Yoga session, and three calisthenics workouts with Sir. Eating: I ate under my goal for two days, and under maintenance for four. Saturday was a bust. Sir and I went to visit his friends who just moved and had a new baby. It became a little party. I thought I was making good choices. Loading up on salad at dinner. Limiting my portions of other dinner foods. Only eating two cookies (instead of the nine or so others had), and eating the fruit for dessert. Well, I was over by nearly 1100! I need to log before I eat in situations like that, not after. Hopefully, lesson learned. Weight: I feel like I did pretty fantastic this week, with the exception of Saturday. However, I gained a pound! I changed my weigh in day from Sunday to Friday, to coincide with FFF. Sir says it may be muscle. He loves me. ♥ I think I'm probably retaining water, or Saturday did a bigger number on my progress than I thought. We'll see next week. I had a yoga mat, and some yoga blocks. I think you could do this without either, if you modify your poses. I needed a pillow for my knee for some of it. Still, I'm excited to do it again tonight. 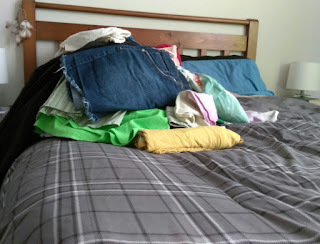 Decluttering the home: I went through my closets and drawers. Made a donation pile of shoes and clothing. Things that aren't relevant, or don't fit, or whose style I've outgrown. I added more after this photo. All to give away, except ONE shirt. Sir had veto power, but he chose to save only one shirt (my 'hangry' shirt). Pretty good! I'm working on my bookshelves next. All in all, in think it was a good week. How are you doing on your goals?